The 6x6 HDMI/HDBaseT matrix supports the transmission of video (resolutions up to 4K2K@60Hz 4:4:4, HDCP 2.2, HDMI2.0) and multi-channel digital audio from 6 HDMI sources to 4 HDBaseT outputs and 2 independent HDMI 2.0 outputs. HDBaseT outputs allow transmission via a single CAT5e/6/7 cable up to 230 feet/70 meters and the independent HDMI outputs support cable lengths of up to 33 feet/10 meters. 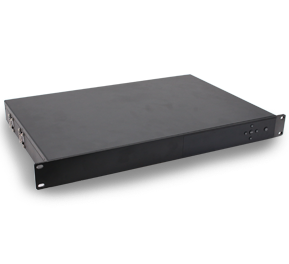 This matrix built-in an independent 18x12 digital audio matrix with volume/delay tuning and also supports high resolution digital audio formats such as LPCM 7.1CH, Dolby TrueHD, Dolby Digital Plus, Dolby Atmos and DTS-HD Master Audio as well as 3D video content pass-through. The matrix can be easily controlled via the front panel button, IR, RS-232, Telnet and Web GUI.